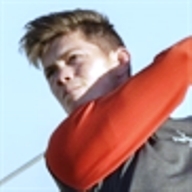 Portlethen's Sam Kiloh (Paul Lawrie Golf Centre) was heading for a sub-70 score in the first round of the European Tour Qualifying School Section D competition at Bom Sucesso Golf Club, Obidos in Portugal until he stumbled big time with a 9 at the par-4 17th and had to sign for a two-over 74. Earlier Kiloh, pictured, had four birdies and four bogeys. James Ross also had a 74 which also finished on a low note with a double bogey 7 at the 18th. Best score by a Scot was a 70 by Perth's Danny Young who birdied the fourth, eighth, 12th and 13th but bogeyed the sixth and 18th and finished the day in a share of fifth place behind the Spanish 1-2 of Jacob Pastor (67) and Sebastian Garcia Rodriquez (68). Craig Lawrie posted a 73 with birdies at the 11th, 12th and 18th. He was joined on the one-over-par mark by late-finisher Michael Stewart. Bom Sucesso Golf Club, Obidos, Portugal.